Google has made no secret of its ambitions in the mobile space. 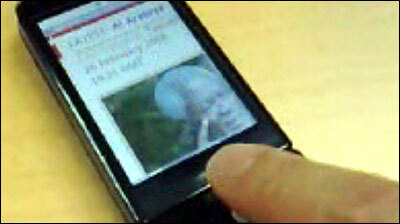 There are mobile versions of all its key services, such as search, e-mail and calendar. But the company is going much further. At the end of 2007 it lifted the lid on Android, an open mobile operating system that is being used to power a new generation of devices under the Open Handset Alliance, a group which involves firms like HTC and chip designer ARM. 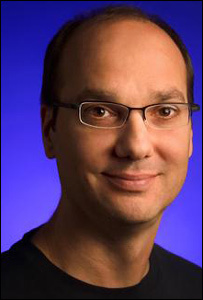 Android is the creation of Andy Rubin, Google's director of mobile platforms. 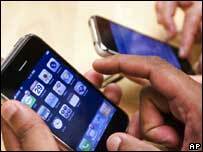 He believes that a lack of openness in the mobile phone space has stifled innovation to date. 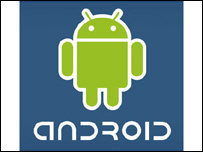 "What Android enables for third party developers is the kind of programming we see on the internet," he says. "What it enables is agility and rapid innovation and the same kind of innovation that happens on the internet." Mr Rubin says that by opening up the phones - from the operating system, released under open source, to the drivers and the application framework - developers will have more freedom to innovate, and more scope also. But if you talk to Symbian and Microsoft, two companies that also build mobile operating systems, both claim to be open also. Mr Rubin says: "There's a distinction we have to make - and it's an important one - between open source and open APIs (Application Programming Interfaces). "APIs are essentially documentation, they're the way that somebody like Symbian or Microsoft will allow third party developers to develop for their platform. "Open source is a mechanism by which the source code of the operating system is actually for free and that way the carriers and OEMs are not really locked into a single vendor, nobody really owns this. "It means they are free to take it into the direction that's important to them; they can fix bugs, add enhancements so in the end the consumer has a better experience." Mr Rubin believes this will lead to greater variety of mobile experiences - driven not by the rules and regulations of an operating system but by the ideas of developers. In essence, it could lead to greater variety of phones and of what those phones are capable. Google has formed the Open Handset Alliance, with manufacturing partners like HTC and chip designers like ARM. At the Mobile World Congress earlier this month the first reference handsets running Android were on show. Mr Rubin gave BBC News a demo of his handset and while the software was in pre-beta form, it was a good representation of what the phones will be able to do. The browser was responsive and driven by both touch and a mini-track ball. Google Maps supported Street View, the ability to see stills of real world locations, which has not been seen on a mobile device before. Mr Rubin says Android is running on a phone powered by a 300Mhz chip, which puts the device in the mid-range of smartphones. "A lot of applications we are seeing on phones today, in some of the newest and most powerful phones, are doing internet style web browsing. "But that is just one of the components of the internet we need to bring to cellphones. There should be nothing that users can access on their desktop that they can't access on their cellphone. Mr Rubin points out that not all net experiences are available through the browser. "Applications like Google Earth and YouTube have specific functionality that hasn't yet effectively been brought to mobile. "Up until Android that wasn't possible on the phone - you could only access functionality given to you by the operating system." Mr Rubin says the open nature of Android will let developers take advantage of the web, of other applications, of the phone's hardware capabilities, from 3D graphics to multimedia capabilities. This is not Mr Rubin's first foray into overturning the "natural order" of things. A former roboticist and Apple engineer, he created Web TV, and the device which led to the pioneering Sidekick handset. "One of my passions throughout my whole career is consumer products; making things my mom would use. "That need wasn't satisfied doing robotics. that was behind the scenes factory stuff." So what does he make of Apple's first phone to the market? "It's a great 1.0 product; I use one. "Apple has that great balance of being both a hardware and software firms so they have a lot of flexibility. "One of the things that is a challenge for them is having an incredible footprint worldwide - there are different types of communications standards, regulatory issues, and different language issues. "I'm hoping that doesn't limit them." With about three billion people using mobile phones worldwide and the number of devices that can access the net climbing rapidly, the future of the web is definitely mobile. And with no one company dominating the mobile arena as yet, the race is very much on.